#1. Our 3 year old was looking at a picture of Nicholas in our living room and asking the usual questions about why he died, etc. He then, so innocently and assertively, told me that Nicholas had to come back down from Heaven to get his Angel Wings. #2. We were driving home from a soccer game last night and our 3 year old asked if anyone was at home. I said "no, we are in the car... there is nobody at home right now". Our 5 year old piped up and said "but, Mommy, Nicholas is at home". You are so right buddy, Nicholas is at home, in more ways than one. He is waiting for us. These are most definitely moments that make my heart sad. Sad that our children are so aware of the reality of death. At such a young and impressionable age they are more understanding of what it means to lose someone they love than most grown ups are. It makes my heart ache that they must feel that pain, but I am also so proud of their purity, their innocence and their love for their little brother. They have had to learn such a difficult life lesson so early on, but they remember Nicholas, they love him, they include him in our family.... and that, makes my heart happy. Hmmmm .... another warm moment. We hadn't even told our five year old godson about our miscarriage thinking he wouldn't understand. Well he must have overheard his parents and internalized it bc in school he stood up and out of the blue told his class that his yaya had a baby growing in her tummy but it died and went away. Strange how children are able to internalize things. Those are very sweet momentos that your sons contributed. Your babies are so cute and very loving! Seriously, you have the most precious, heart warming children. It just brought tears to my eyes reading this post and about all of your precious boys. I love the innocence and pure honesty from children. We can learn a lot from them. Oh Lea...you boys are so sweet...and very cute! I hope you are enjoying your days at the cottage. Hugs! Out of the mounth of babes. My son was almost four when my mother passed away and he asked me " When grandma is done dieing is she coming back to be with us?" 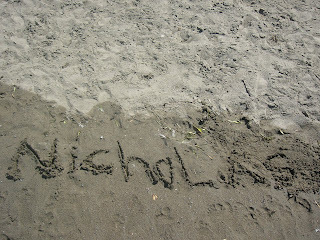 Love the name in the sand. Wise before their time! I think it is wonderful that your conversations are open and real. Wow, each of those stories is so special. I'm sure your heart did overflow with love and sadness at the same time. How wonderful your boys openly talk about and think about and LOVE their little brother. Oh what sensitive and kind boys you have...the product of loving parents. Its heartbreaking they've had to learn these lessons so young, but clearly you are loving Nicholas in such a beautiful way that the boys celebrate and love him with you. I'm not sure I said what I feel in a way that makes sense, but really, just beautiful stories about the boys. My oldest daughter was just 2 when her sister died....she's started to tell us that baby Rose is 'at her house'.... I can understand the sad/happy heart. oh, this brought tears to my eyes. envisioning your son crying over the potato bug tugged at my heart. your boys are so sweet. it's refreshing to see such honesty, but heartbreaking at the same time. i'm so sorry that they are feeling this pain, so young. Your boys sound absolutely gorgeous - your post gave me goose bumps. My son is a little too young to understand about what happened to his brother, but he's going to one day understand that he has a little brother in Heaven. these are such beautiful stories of the ways that little nicholas is remembered fondly and often by his siblings. 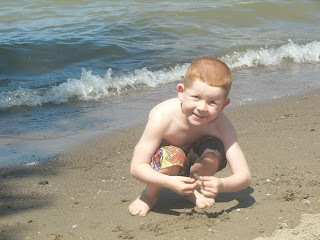 the name in the sand was such a big gesture of love from such a little guy... really touching. It is a horrible truth to teach older siblings while they are so young. My daughter was a year old when my son was stillborn. I don't know how much I'll tell her while she is so young. I don't know what would do more harm than good, what is necessary, and what is for my own good rather that hers. Glad in a way that she was too young to know. I can not imagine the conversations you've had to have with your boys. But it sounds like you did it right since they view him as part of the family and have such a real look at the loss of life. What a lovely thing for him to do! My littles went out and made a snow family during a freak april storm after William died, and they made a "snow baby William" in my arms... it was such a sweet thing, so bittersweet. I cry just thinking about it. What incredible moments. Sad and happy, I'm sure. I can only imagine how they warm your heart.